Day. Interior. The seventh-floor passage of an apartment block. At one end of the passage is a window with only a glass pane, no grille. Through the blurred and tainted glass Ernakulam and beyond lies refracted; rooftops, backwaters, tugboats and the Chinese nets in the estuary spread out at many levels — an error of perception. On the door leading to one of the flats is a plastic nameplate; the once-white letters announce: K.A. Sarasamma. Below the name: IN/OUT. The tiny shutter that is supposed to slide over either of these has fallen off, creating an aura of perpetual uncertainty. The bell-push is like an island of dirt on the white wall. A young woman’s forefinger — the nail painted a dull red — extends towards the bell-push. Neelima opened the door. She wore a faded green tunic — the dark wet maps on it telltale signs of the dishes she had been washing. The sound of running water could be heard from the kitchen. 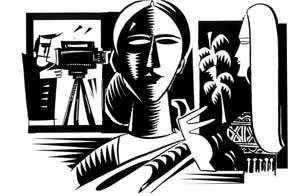 As she noticed the glimmering red light of the Betacam camera, Neelima’s hand unconsciously went up to pat her hair into place. She asked: "The camera is on, isn’t it?" "Yes," said Susan. "Amma is on the veranda with my son." Then raising her voice: "Amme, the TV people have come." "Bring them over. Their coming is auspicious. Baiju mon  turned over for the first time today." Sarasamma sat on a woven mat on the floor — calm, her grey hairs a testimony to the experiences she had willingly courted in life. This first encounter surprised Susan. Sarasamma seemed totally engrossed in her attempts to entertain the child with a rattle … again made of woven palm leaves. The toy appeared strangely incongruous, almost an antique among the plastic playthings that littered the floor. "Mone, see who all have come! They have come to take pictures of this ammumma  of yours. See this chechi! She is from Delhi. She has travelled all this distance to take pictures of ammumma." "Amma, could you stand up holding the child?" Cameraman Naresh asked. Sarasamma got up, smoothing her mundu  as she did so; then stood against the balcony railings — the backwaters and the sky forming the background. The baby drooled happily in response to a sudden breeze. A plane rose from Kochi airport, shimmering like a knife-edge against the sunlit sky. chakkarakuttan shouldn’t cry; va, va, va…"
"The sight of so many of us together must have frightened him." Susan said apologetically. "Aye, he isn’t wary of strangers, are you kutta? He must be hungry. Pavam ! Neelu, breast… it’s time for his feed." Neelima carried Baiju into the bedroom and closed the door. After a while the wailing ceased. "I told you he was hungry!" Sarasamma continued: "Let’s go into the drawing room. We’ll have the interview there." When the Party split up we thought it would lead to a cleansing, but everything continued as before… election-oriented politics. Then the Naxalite movement began in Bengal; armed revolution re-entered the agenda. Kilori went to Calcutta. As she sat down on the sofa Sarasamma asked: "Child, why did you come from Delhi to take my picture? It’s such a distance, and what an expense!" "A British TV channel wants to do a series on a few Asian women — women like you who have had a wide range of experiences. I was assigned the job of interviewing you. Moreover, now there will be a record for all time!" "Where do you belong to, mole?" "My father is from Cherthala. He’s a brigadier in the army." "Aye, I’m not all that old." "Twenty-two, coming September. September 10. A Virgo — one who tends to view things analytically." "I don’t know… I don’t believe in all that. Any boyfriends?" "Amme, where is the power point?" the camera assistant asked. Susan looked at him gratefully. "Over there, by that window." Sarasamma replied. The make-up man approached her and began to apply make-up with a cotton swab. Susan watched Sarasamma’s bewilderment. "What are you doing? I don’t want this beauty parlour stuff," she said, shying away. "No Amma, this is not to glamorise you: it’s just to soften the features so that the camera captures the light effectively." Sarasamma gave in to the make-up man’s efforts. As she watched, Susan got a glimpse of the schoolgirl of some sixty years ago. "May I switch off the fan, Amma?" Susan asked. "It’s whirring will affect the recording." "But won’t the glare of your camera lights make it hot?" Sarasamma settled herself more firmly on the sofa, bracing herself for the interview. Susan watched the aged muscles tense. The shoulder-length hair was something she had not expected in someone of that generation. "We are ready." The cameraman said. An interview should begin informally, a necessary ruse to overcome the nervousness of first-timers. Susan began with a smile: "It won’t be right to call you Sarasamma. Shall I call you Amma?" Susan: After all, there was a time when you were Amma to the entire Naxalite movement of Kerala." Sarasamma: "Aye no, just for a section of it. There were several factions, child." Sarasamma’s cultured English accent was a surprise, but conscious of limited time, Susan didn’t probe directly. Susan: "You seem to have had a happy childhood." Sarasamma: "My father worked in Singapore; he was the Principal of a school. I was born there. My childhood was spent among Chinese and Tamilian children. We learned Mandarin Chinese at school. I have forgotten it all now. We were sent back to Kerala before the War began. We — my mother, younger brother and I — arrived at Nagapatnam by ship. I was ten years old." Susan: "Was it after your marriage to Kilori Gopalan that you entered politics?" Sarasamma: "Yes, but even before that I had leftist leanings. I was a member of the Students’ Federation. I did my BA in Bombay. It was at that time that the mill workers of Ahmedabad went on strike; you might have heard of it. It went on for months. Starvation reigned in the mill colonies. A group of our people left for Ahmedabad as volunteers. It was there that I met Kilori for the first time. He was the secretary of a trade union in Bombay… we were married a year and a half later in the union’s office in Bombay. A.K. Gopalan came for the wedding… and Dange." Sarasamma: "They were charismatic leaders of the Communist movement, child. You don’t know all this, do you?" An experienced interviewer, Susan did not show her embarrassment. Susan: "When did you come to Kerala?" Sarasamma: "In 1964. The Party had begun to split. There was the rift between China and Russia." Susan: "But why did that make you come to Kerala?" Sarasamma: "The leadership asked Kilori to form a unit of the Party in Malabar. All the other leaders in Kerala were in the right wing. Only A.K.G. remained on our side. During those early years E.M.S. took a neutral stance. Have you heard of him, E.M.S.?" Susan ignored the sarcasm in Sarasamma’s words. Susan: "And then? Differences of opinion cropped up between Kilori and the leadership almost immediately…?" Sarasamma: "Yes. When the Party split up we thought it would lead to a cleansing, but everything continued as before… election-oriented politics. Then the Naxalite movement began in Bengal; armed revolution re-entered the agenda. Kilori went to Calcutta." Day. Outdoor. A narrow lane in Kalighat. Frightening vermilion marks on the foreheads of people returning from the Devi temple. A narrow doorway of an old house — a dark room — then a sudden flare of video lights, like a flash of lightning. Old framed photographs of Marx, Lenin, Engels… An old man lying on a rope cot below the pictures suddenly sits up. Old man: "I’m Vishwadeep Sanyal. I was a proofreader for Liberation, the mouthpiece of the Naxalite movement. Kilori Gopalan came straight from Howrah Railway Station to the Liberation office. I was asked by the Party to accommodate him in my lodgings. The Comrade was with me for about a month…"
Susan: "Why did Kilori come?" Sanyal: "To form an alliance with Bengal. He spent whole nights reading pamphlets and translating them into Malayalam. He also spent some time with Kanu Sanyal in Naxalbari. Kilori was a striking personality… anybody would notice him; six feet three inches tall, a wrestler’s physique; when we travelled in trams people got up and offered him their seat, saying, ‘Please sit, dada.’"
Susan: "Did he come again?" Sanyal: "Yes, in 1968. The movement had really picked up in Bengal. It’s enough if I tell you that all of Presidency College was with us. The Party leadership criticised Kilori; they said that the movement in Kerala was not going along the right path… it had confined itself to art and cultural activities. Kilori was piqued when he left for Kerala that time." Susan: "And the last visit was during the Emergency…"
Sanyal: "Yes, in 1976. By that time we had reached the end of our tether. Many of us were in jail, many died, many were killed. Kilori and his wife left Kerala and came here. They had jumped parole, so they couldn’t stay on in Kerala. On top of that, Kilori had cancer. Leave alone the Party, there was not a single comrade to give them asylum. Finally, they stayed with a relative in Dum Dum." Susan: "Kilori died that very year…"
Sanyal: "Yes. I stood near a paan shop and watched them carry the corpse to the cremation ground near Rashbehari Avenue. Kilori had shrunk… apart from the pallbearers there was just his wife. That day many of our Party men surfaced in nearby paan shops and flower shops. We avoided eye-contact… just kept murmuring: ‘Lal salaam…Lal salaam.’"
A short break. Sarasamma looked tired. The make-up man once again touched up her face; the cameraman inserted a new cassette… Neelima came in from the kitchen to serve tea. Susan said solicitously: "Amma, you appear to be tired. Could you tell us something about the attack on Neeleshwaram police station? After that, we’ll wind up for the day." Sarasamma: "It was an all-woman operation. The sub-inspector, Kelu Nambiar, was notorious for hounding women. Our goal was that the actual oppressed should confront the actual oppressor… but Kelu Nambiar escaped." 4. Mundu  traditional attire made up of two lengths of cloth. N.S. Madhavan is an award-winning writer of Malayalam fiction.